Crinum natans is an aquatic plant from West Africa that is still very rare in Australia. This Crinum is regarded as the largest and most rarest Crinum out of the three species that can be kept in aquariums. The natans had a unique leaf structure. It is long, 1-2cm wide, wrinkled and dark green which can grow upto 1.5m long. When planting this unique plant, the bulb must not be below the soil surface, and roots must be widely spread throughout the substrate. 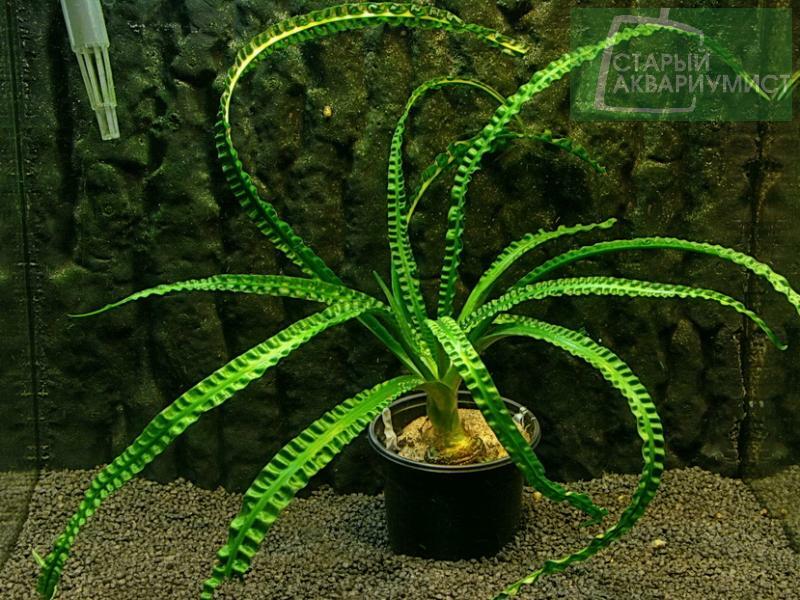 Being such a large and unique plant, with aquascaping, the natans should be a feature plant. Being a large grower, the Crinum natans' growing spot should be carefully considers. They require high lighting, even levels of co2 and ferts. With regards to substrate, it is highly recommended to use high nutrients substrate/soil such as ADA Aqua Soil. The Crinum natans take up a lot of nutrients via the massive roots systems, so planting rich fert tablets ever few months will definitely benefit with the growth of this magnificent plant. Propagation of the Crinum natans is quite difficult in the aquarium compared to its cousin the Crinum calamistratum. Propagation of the Crinum natans in Australia has not be formally documented. Propagation might be the same as the calamistratum via baby bulbs and by seed germination. Being such a rare plant in Australia. Prices has been extremely high and availability has been rare. The average price for a small plant of a few leaves average $150-$250. While adult plants has been seen to go over $400. So if you have the opportunity to get your hands on any size of Crinum natans, consider yourself very lucky.